Mario Draghi of the ECB (European Central Bank) has cut a deal to fight inflation with BlackRock to advise on a possible bond-buying scheme to flood the market with euro cash. BlackRock will help the ECB to design a program to buy asset-backed securities as part of the regulator’s plans to ease credit conditions in the Euroland. 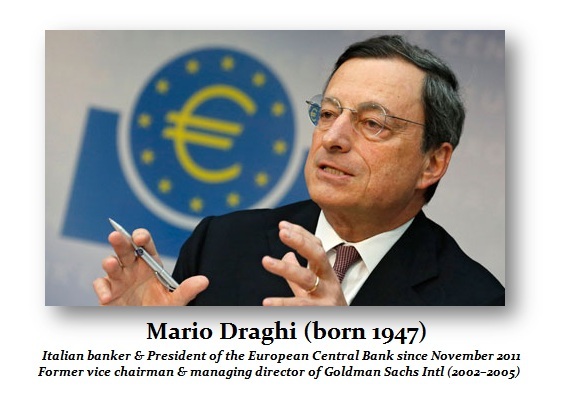 Draghi, ex-Goldman Sachs, believes that a scheme would create demand for securitizations within the Euroland and provide incentives for lending to credit-starved businesses to get the economy going again when the banks have failed. BlackRock had been appointed by the Greek central bank this year to probe its four big banks’ balance sheets. It was BlackRock which also worked with the Central Bank of Ireland during the Eurozone debt crisis. It will now provide the ECB with advice on the design and implementation of a potential ABS purchase program. Mario Draghi has suggested that the central bank could buy packages of bank loans to households and companies as one way of fighting deflation. Effectively, this is the same idea that was behind the real estate boom going into 2007. Consequently, it is always the same scheme over and over again. Draghi has also warned that too few simple asset-backed securities were being sold in Europe, which needs the leverage from his point of view. « Can the Internet Also Replace Career Politicians?